Hear Samuel’s story from his mother Alwena. Samuel suffered a Spinal Cord Infarction whilst playing rugby in October 2015, he was 9 years old at the time of his injury. He became paraplegic using a wheelchair. He was a very active sporty child who suddenly couldn't take part in the football and rugby that he loved. He loves being part of a team and suddenly this was taken away from him. Samuel has worked hard with his Physio and although there is some improvement we still have quite a way to go! Initially, as parents we became very protective and felt we could manage everything on our own! We didn't need help and especially not charity! A teacher at Samuels school told us about the Matt Hampson Foundation. I looked at the website but I really just couldn't see past the fact that what we needed was Samuel doing everything he could before, so I parked the foundation to maybe visit again on another occasion! I formally contacted the Foundation in August and although I don't speak to them every week or every other week we are helped and supported by the foundation every day! Since Samuels discharge from hospital we get very few amounts of NHS physiotherapy even though he is still in a recovery phase! We found a private Neuro Physiotherapist and the Matt Hampson foundation pay for us to see her twice a week! Without this I dread to think where Samuel would be in his recovery! 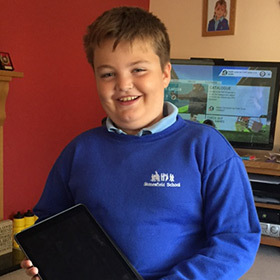 Samuel also had a massive surprise when Matt and Tommy sent Samuel an iPad! He absolutely loves it, he rarely goes anywhere without it and not only uses it for the usual games but for school too! He even made a power point presentation on it for his Educational Health Care Plan, which allows the people deciding about Samuels future more of an insight about him. I also have another point of contact to ask advice and ideas! Thank you, you are amazing!